Gretchen Garrison loves stories. She enjoyed reading stories to her students as a classroom teacher and has continued that while homeschooling her four children. Back in 2013, she was anticipating teaching the topic of Nebraska, her home state, as her main topic for the school year. But she couldn’t find the stories. She found a textbook (Nebraska Adventure – highly recommended), and she found several books. But finding online resources on Nebraska was challenging to say the least. 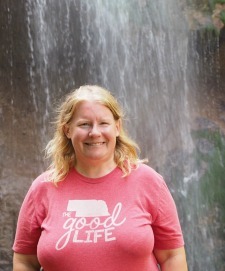 Gretchen decided to start the blog “Odyssey Through Nebraska” on July 1, 2013. At that point, she moved past being a story reader and became a story collector. Her tagline: the people and places of Nebraska, both past and present. By writing the blog, Gretchen knew that her family’s upcoming Nebraska travels would become more purposeful. She would travel with the intention of learning more to share the stories with others. Now her blog has become a resource to help others who also want to make their own deliberate plans when traveling the state. By telling the stories of the past, the blog is a reference for those who enjoy learning more about how Nebraska has grown and developed through the years. Either for their own enjoyment or to be able to tell the stories to their own children and grandchildren. Recently Gretchen collected many, many stories into her first book, Detour Nebraska. This book travels across the state. While familiar places are noted, particular time was spent capturing the stories of the unfamiliar Nebraska locations. If you are interested in buying this book, details are given on this page. Do you have your own stories about Nebraska to tell? Contact Gretchen to arrange the details. You can have her write a sponsored blog post featuring either your organization or Nebraska related product. She is also glad to share about your Nebraska events on her Odyssey Through Nebraska Facebook page. Do you need someone to tell Nebraska stories to your group or organization? Contact Gretchen to arrange for her to talk about Nebraska. She is even willing to include photographs as a part of the presentation since she has several thousand to choose from. To work with Gretchen, please e-mail odysseythroughnebraska@gmail.com or give her a call at 402-310-2378. Note: Unless noted all blog posts and pictures on “Odyssey Through Nebraska” were composed by Gretchen M. Garrison. As for the author picture on this page … Well, that was taken by a random stranger at Smith Falls near Valentine. She forgot to get his name. Gretchen and her husband, Kyle have four children. Having four kids in six years might be the reason why they both started drinking coffee. Their family business is GP Restoration and Blasting. She loves teaching a weekly homeschool middle school geography class and being a part of her weekly homeschool co-op. Church is also an important part of their family life. Gretchen was born on a Husker football Saturday. If you are from Nebraska, you know that is a big deal. Kyle and Gretchen toasted to Dr. Pepper at their wedding. She still drinks a Dr. Pepper every day. He switched to daily Mountain Dew. She tries not to hold it against him. Gretchen’s favorite restaurant is Runza. No longer living down the street from own, she has found that she does not frequent this Nebraska fast food place quite as much.